As a bit of a break from painting figures, I thought I would try wargaming. I am about one third of the way through my goal of building the main armies at the Battle of Fuentes de Oñoro at a 1:50 figure scale. I have so far painted 4 divisions (1st, 3rd, Light and Cavalry) of the British forces and 2 of the 3 divisions of the 6th French corps of the Army of Portugal. All the artillery of both sides is completed and I have just finished the Imperial Guard Cavalry Brigade of the Army of the North (just could not resist). I have been looking at several rules at the tactical level ( I want to maneuver Battalions) for some time and settled for Le Feu Sacre rules from Too Fat Lardies . They have an active and helpful yahoo group. The rules are card driven and resolution of combat is quite simple in comparison to many games. I am starting from a point of zero knowledge of wargaming and a minimal knowledge of the Napoleonic era (all gained from reading the Sharpe books). I am trying hard though and am working on my first game. I thought I would use this post to document my attempts to learn wargaming using Le Feu Sacre Rules.What follows is pretty Le Feu Sacre specific, being done in order to review my application of the rules of the game rather then the tactics of general Napoleonic wargaming. This is my second go at playing the game after taking advice from the inhabitants of the LFS yahoo group. The first photo shows my terrain, it is 8'x4' and has very simple features. There are no roads. In the foreground (the west) is the River Coa with the Almeida fortress to the northwest. The area southwest of the river is the game ending area of the British, once all the forces are there the game is over. There is rough terrain east of the river which is impregnable to the troops, the only way they can get over the river is just to the east of the simple bridge. To the far east is the French starting area. The wooded area is the Vale da Mula, the French need to start east of here. I have taken my Order of Battle from the Osprey Campaign book on Bussaco. It was a small battle between the British Light Division under Crauford with an attached Cavalry brigade under Anson against elements of Ney's 6th corps in the French Army of Portugal on July 24, 1810. I thought it would be simple as a starting point to learn some wargaming rules with an uncomplicated terrain setup. 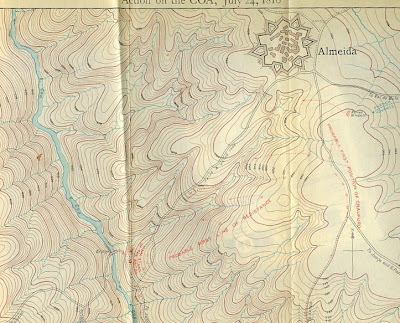 A summary of the battle with map can be found on this Peninsular War site. Le Feu Sacre ruleset requires that each independent command be given specific orders. This was less important to me in this first game as I am trying to learn the mechanics of the game. Generally, I want the British to start in the left side of the table east of the River Coa, with the plan to perform a reconnaissance role and withdraw immediately west of the river at the first signs of trouble. These were Wellesley's specific instructions to Crauford. The French were to start on the right side of the table and engage the British and prevent them from retreating over the bridge. The game is over when the British forces escape over the Bridge. Specific instructions given are described in the next post. So my first problem of course is that I am a solo wargamer and Le Feu Sacre is a multi-player game and uses the concepts of blinds. Essentially each player has blank cards for each of his commands as well as some dummy blinds, he deploys these on the table with his starting position for each tactical unit. He knows what is what with his army, but the other player does not. This I think is one of the great parts of the game, but I am playing by myself so what to do? So I have to pick one side and thus picked the English (in this scenario they appear to be in a weaker position). So essentially I have decided to know the positions of the British and am blinded to the actual positions of the French. The next post will document my testing of this plan and my attempt to correctly apply the rules. Anson-Maneuver forward half way up the terrain, do not attack, return if enemy encountered. Barclay- Hold the Bridgehead over the River Coa. Deploy 1/95th Rifles forward half way up the terrain, do not attack. Immediately return if enemy encountered. Beckwith- Maneuver forward and form forward defensive position in front of Barclay. Deploy 2/95th forward as above. Lamotte: Attack north and centre, protect the north flank of the infantry. Simon/Ferrey: Attack down the centre, stop the British from crossing the bridge. Gardanne: Attack south, support the south flank of the infantry division. Three blinds are set for the British, 3 for the commands of Beckwith, Barclay and Anson and 1 dummy blind. These were numbered, shuffled and laid on the terrain without my knowledge of which was which. Where the plan for the British was reconnaissance and withdrawal the blinds were placed in a semi-deployed position. As you can see in the far east the 4 French blinds are all deployed in a column of march. Their game plan was to attack so they were thus deployed for rapid advancement. The 4 French blinds were lettered A,B,C,D and assigned one of the 3 French commanders plus a dummy blind. My 13 year old daughter (who thinks I am crazy) did this so I did not know which letter represented which commander. Until the blinds were spotted they were all made LFS Solid commanders (Dav=0). The blinds for the opposing armies are more the 48" apart at the start. Sixteen card were utilised. Crauford, Anson, Beckwith, Barclay, Allied Gifted Bold (AGB), Cautious/Poor(CP), Ney, Loison, Gardanne, Lamotte, French Gifted Bold(FGB), French Grand Tactical(FGT), and French Blinds A,B,C,D(FBlA..) Loison, Gardanne and Lamotte cards were not placed in the deck until their respective blinds were spotted or voluntarily revealed. So the British blinds were then flipped over and as you can see it is Anson, Beckwith, and Barclay from north to south, with Crauford on the Barclay blind. In the far east you can see that Marshall Ney has been placed on the second blind from the north. Barclay's Bde: no spot, Dav3-1=2 pips, Semi-deployed to deployed (1), Voluntarily reveal 52nd and 1st Caçadores in 2 lines, 95th rifles in column of march, 95th advance 8"(1), Barclay moves forward to stay in touch with both rear and forward positions of his Bde. Fully-deployed blind placed in front of troops to illustrate that width deployment rule not broken. FBlC: No spot, Dav4=4pips, advance 16" (2), change from column of march to semi-deployed(1), advance 4"(1), now within 24 " of 95th rifles. Ney: is on FBlA, no spot, Dav5=5pips, FBlA advance 16"(2), Col/Mar Bl to semi-dep Bl(1), now advances to within 16" of 95th Rifles(1) ?stops because blinds can not advance closer than 16" to a formed unit, last pip not used. Crauford: FBlC is 33" D10=7 no spot, Dav4+1=5pips, All commands are already moved, he moves forward 16" and then some more to stay within 8" of rifles(1) ?4pips lost, was there anything else he could do. Barclay: Attempt to spot FBlA(22") D10=3 no spot. Dav4-1=3pips, is within 8" of 95th, order to form line(1), turn 180 degrees(1), advance 8"(1), Barclay withdraws to his infantry bde. FGT: given to FBlA, attempt to spot British(33") D10=8, no spot. Dav4-0=4pips, advance 16"(4). stop 16" from 95th. Crauford: tries to spot FBlA(16") D10=9, spots Gardanne!deploys in 2 columns of attack. Here is where the rules gets murky to me, as all the British commands have moved. Here is what I do, but I am not sure if it is correct. Bombardment from Anson's RHA to French Cav reg(10")+1(B Class Art) 2D6=5+1=6 miss. Not sure if this is right as Anson has moved in this turn, when do you bombard without pips?. Dav4+1+5 pips, Crauford moves back to within 8" of all commands, orders Barclay(2) to about face 180 degrees(1), form line(1) and retreat 8" over bridge *"(1). The rules appear to suggest that units not within 16" of any enemy can make multiple moves, is this how you do it? Situation for British: In retreat, 1/95th rifles stranded forward. Beckwith still on blinds. Situation for the French: All units off blinds, but infantry in base to base contact. Lamotte's first Reg of lancers shaken, second reg advancing to British cavalry bde. Gardanne (LFS Cautious) ready to advance. For some reason I just could not get this game finished, my apologies. I found movement was just to complicated; too many zones of control and complexities to interpenetration. Maybe I will give it another go sometime in the future.